Readers know that we reviewed several Adesso products last year, some of which we loved, some not so much. 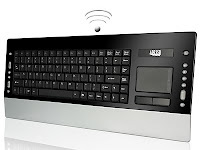 This week the company added to an already packed line-up of wireless keyboards with the introduction of the new KB-4200UB model. The full sized Adesso KB-4200UB packs many of the features we've loved in older models along with a newly more conveniently place trackpad (non-multitouch, it seems). The new location of the trackpad should make it slightly more convenient for most users, an issue we noted in our review of the Adesso WKB-4000UB. Available at various retailers, the WKB-4200UB has an MSRP of $119.99 and should be available for purchase over the coming weeks.